Brand performance – two words that can make even the strongest businesses quake. Why? With the shift toward more web-based businesses and combined web-and-mortar businesses, brand performance has taken on new value. Brand equity, or how much worth your brand has in the eyes of consumers, will dictate your success. So it’s important to have a means to measure your brand performance. Customer satisfaction surveys help you do just that. How better to determine your performance than to hear what your customers think about your brand? 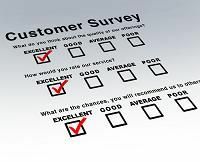 With an effective customer satisfaction survey, you can elicit profound and valuable details based on your customers’ interaction with your business, and then adjust your products, services and marketing efforts accordingly. Do your products or services match the needs of your target consumer? Will and do your existing customers refer others to your business? How many customers have done business with you previously? How do customers rate your sales staff and customer service department? What makes your customers buy? What motivates them? Are you providing customers with the necessary information during the research phase of the buying process? Do your customers want information on your other products or services? How soon are your customers planning to return to the market for your business? Your analysis also should incorporate graphs, images and charts that allow you to easily see buying rationale and decisions based on the surveys, as well as existing customer behaviors. Who better to take your cues from than your own existing customers? Find out what they have to say with customer satisfaction surveys. Continuity Programs offers turnkey marketing solutions for businesses that span over 20 industries, specializing in company branding, offering comprehensive personalized marketing solutions.